12 in atomic clock is synchronized by signals from the atomic clock in Colorado, even adjusting itself for Daylight Saving Time. Never needs resetting! 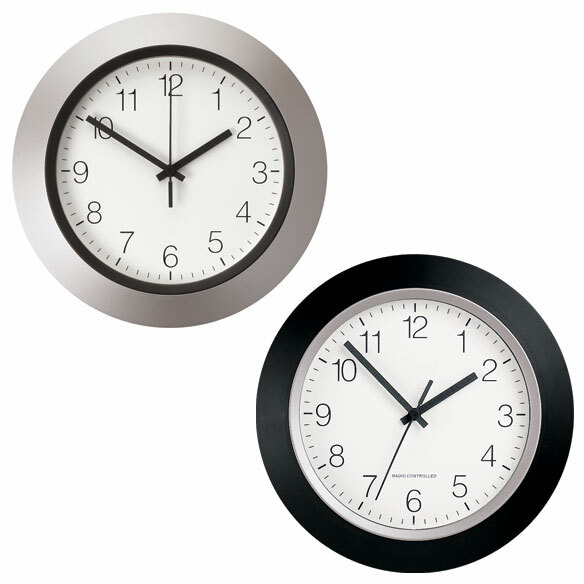 Atomic wall clock in dome shape has high visibility with 9" face. Requires AA batteries, not included. I shopped many merchants before picking this clock. I was surprised to find the quality of this item. VERY satisfied. Hung on wall in family room, looks good, fine product. I do like the clock. Just what I wanted. I have been searching and searching. I will donate this clock to my church so that everyone can always see the correct time. I have already given them another atomic clock, but they need another one in the fellowship hall. I was unfamiliar with the atomic radio controlled clock, so it took me a while to set it to the correct time. It looks great and easy to see the numbers. I love my clock, very easy to read, never need to set it, very attractive. I have 5 other atomic clocks and this is the best one. I have ordered a second one for my bedroom. It is very well made-a precision product. It checks for accuracy every other hour, 24 hours a day. Starting is a little tricky. Follow the instructions exactly. It goes through a seeking cycle, then it pauses and synchronizes the dial with the internal clock. Wait for it to do so, The clock may seem to be doing nothing. Wait. This clock is very sensitive to the WWV signals. Much more so than my other clocks. If it doesn't work, rotate it 90 degrees and try again. It will not work inside your refrigerator!! It works beautifully. Sets itself so you can "set it and forget it"
Does everything the ad said it would do. No more setting clocks. I would buy this product again. I love these atomic clocks. Just put the battery in and let it set it self. I never have to worry about daylight savings. It works like a clock should work. At first, it would set. The instructions said to have it by a window, so I place it by a window and it did set itself, even when daylight savings times started. Attractive design, easy & clear to see the time. Well pleased with my purchase. We love our new clock. Put it in our bathroom. Love that it's radio controlled, and has a daylight savings adjustment. I live in a semi rural area and wasn't sure the clock could pick up a signal, but it did. Nice to have a clock that sets itself. I don't know what the fellow in Michigan is talking about. This is the senond LaCrosse Atomic clock I have owned. First one was purchased from [@] 3 years ago and is still receiving the time signal and setting itself correctly. It is never wrong when I look at it and compare it to my atomic wristwatch. Second one was purchased at Miles Kimball 3 months ago and it is FINE! I think the fellow in Mich. did not give the clock the 24 hours or so it needs to set itself correctly. After it does that it is never wrong! Both of mine are showing exact same time and they are in different rooms. The clock needs to receive the WWVB signal during dark hours to set itself. Let it hang up for a day and you are all set!! This item is real good. Had no problem at all with setup. It is exactly the wall clock I been searching for and found. Very Nice looking in Chrome. Perfect hanging in hall! Can see large numbers easily from a distance. At first, it wouldn't set the time. The instructions stated to have the clock by a window, so I placed it by a window and it did set itself, even with daylight savings times started. Finally! A clock that keeps precise time and looks as if it cost much more than it did. The instructions are clear and easy to follow. I live in the Smoky Mountains of East Tennessee. My clock took about three hours to link with the atomic clock. A week later, it adjusted itself for DST. When first started up, the hands spun around a couple of times and set themselves to the incorrect time. I thought this isn't good. About 2+ hours later I walked into the room and the clock was showing the correct time. Love this clock. Mine is in the bathroom. It was a bit tricky to get the clock "up and running," but once I did it set itself and change itself at daylight savings time. It is attractive and it runs great! The clock is easy to read. It was bought to help elderly mother-in-law to keep track of time. The loud ticks do not bother her, just me! Bought for elderly parents so once set it, its set. When the time recently changed to spring forward, it resets itself. Numbers are big enough to be read from afar. They are satisfied, so I'm happy. Best asset is that the atomic clock needs minimum maintenance. No need to adjust to daylight saving & back to standard. Another asset: accurate time. When they want to improve the clock, they could add luminous dials on the hands. So you could see it late at night. Needed a clock for our motorhome and like the atomic clock timelyness and how it resets itself as we travel. The precise time all of the time! Everone who works for me comments on the ease of reading the time piece. Sent it back as it wouldn't work. Tried all methods and could not get 'signal'...it works but since it did not pick up 'signal' , doubt if it will when time changes again. Poor quality- Not worth price. Pro ; Will be sent another clock. We have a clock like the silver one that is no longer working. We like the Atomic Clocks and plan to replace the old one with this one. I like that it sets itself ! Being a senior citizen I did not want someone to come and have to change the for me. They reset themselves and look good. I have always wanted an atomic clock. Never have to adjust the time again! As an atomic clock it automatically changes the time. I am unable to leave my house --, so all my shopping is over the internet. So I know I will always have a clock in the house with the correct time. I just needed a clock. It's nice that I won't need to adjust it during daylight savings! I like the idea of a clock keeping accurate time and think this will look nice on my kitchen wall. One reviewer said it has a loud tick so hope it isn't too loud; I don't want to make people super conscious of the time when visiting. So I can tell time in my bedroom and have accurate time. I needed a new Kitchen Clock that was/is reliable and this one seems like the perfect choice. I have trouble clipping my toe nails. I need a kitchen clock I can read from a distance. I have a hard time seeing. Will be so nice not to have to change the clocks twice a year. BEST ANSWER: I purchased one of these atomic clocks for my study area and was really pleased with it that I ordered another for my bedroom. It is wonderful to have a clock that is alway correct...even if the power goes out...and even when the time changes take affect during the year. The size is big enough that I do not have any problem reading the time from across the room. I highly recommend this clock. You have not answered my question: how do you set the clock when you first get it? BEST ANSWER: You don't set it yourself. It sets itself automatically daily via a signal from Ft. Collins, CO. You need to be sure the clock has batteries and is set for your time zone. Then wait for the signal to come within 24 hours.